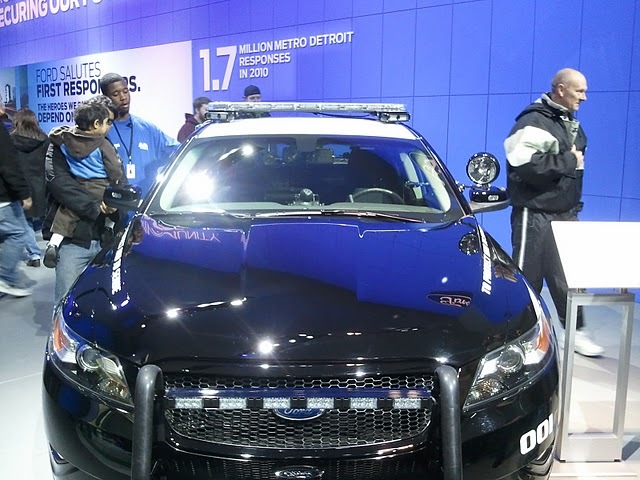 This past weekend I visited Detroit’s 2011 North American International Auto Show, where Ford used the opportunity to show off its new police Interceptors (check out Ford’s site complete with siren loading graphic and nationwide tour dates). Seductively displayed in front of a slogan proclaiming, “Protecting Our Community. Securing Our Future,” and the message, “Ford salutes first responders. The heroes you depend on depend on Ford,” the cars were hard to miss. There was something rather striking about the Interceptors -fierce yet sleek- that seemed to draw a continuous crowd of all ages. The name alone is alluring: Interceptor. It rolls off the tongue and brings forth images of blockbuster car chases complete with explosions and gritty, attractive male leads like Jason Statham or Daniel Craig. As I stood listening to the soft “ooohs” and “ahhhhs” of passersby and watched dozens of people whip out their cameraphones (yours truly included), I asked myself who Ford was trying to sell the Interceptor to -the police or us? Moreover, what was Ford really selling -the car itself, an “ideal” representation of the police, a car-chase fantasy, their own “Ford-tough” image, or all of the above? ← Police and the Social Network – Rights at Stake? 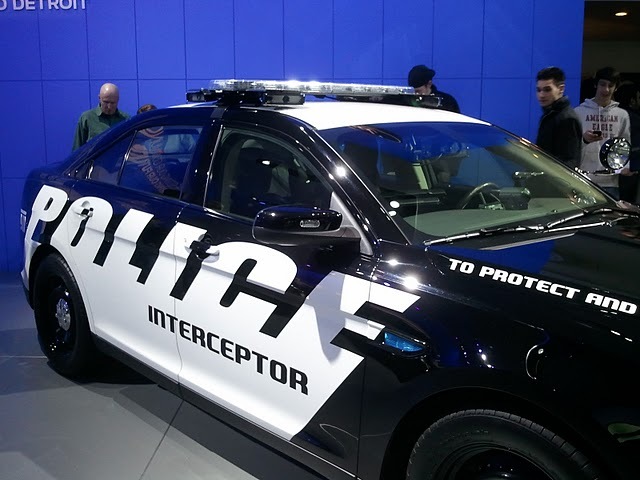 Ah, the good ol’ “Interceptor.” In fact, Ford has been using that name for the old Crown Vic cars that I and other coppers have been pushing for years, long before Daniel Craig. The new Interceptor has to be understood against in the context of significant realignments in the chain of auto production and the background of the phasing out of production of the Crown Victoria, the immense popularity of the Dodge Charger which gives cops a truly high performance vehicle, and the need for a pursuit rated vehicle that actually can do what cops need it for on a daily basis (which is not primarily interception, but prisoner transports, better seat designs to handle all the gear we have to wear and carry, space for all the flashy computers and gadgets that are now required, and importantly more safety). My problem with the Charger, is that, while cool, it is not ideally constructed for what cops need. Visibility is poor and the prisoner compartment is just minimally adequate to transport with. Moreover, police due need vehicles that are pursuit rated and even more importantly, drive well! A Crown Vic is a pursuit vehicle, but I can think of few cars less ideal to be driving when there is a need for safety, control, and agility during a pursuit. It is, after all, the same car that many of our grandparents drive! It is safe because it is large, not because of other safety features, good balance, traction, etc. 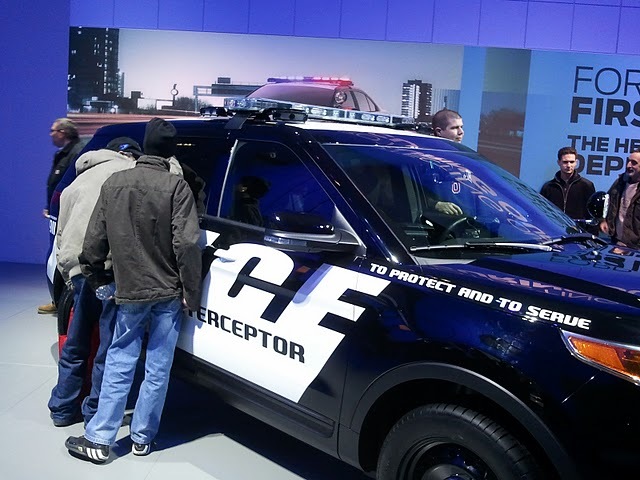 Ford is in part responding to pressures from Dodge, but perhaps more importantly, from a new automaker, Carbon Motors, which has been producing the first purpose built police vehicles. These cars have the look of something like Charger but with a Turbo Disel engine that last about 250K miles (150K more miles than a standard Interceptor engine), and, if I recall correctly, is up to 20% more fuel efficient. in terms of marketing, the last 10 years have seen a proliferation of companies that sell “tactical” gear to cops and soldiers (think Blackhawk, Galls, 5.11 Tactical, just to name the big catalogues and companies). It is a very profitable industry with lots of competition. Trade shows have appeared, like the SWAT expo, that look like small versions of the tech and industry shows that Defense Contractors have put on for years in order to market their wares to congress and the Pentagon. Make no mistake, the aesthetic design of the new generation of purpose built patrol cars is tightly honed to what is believed to be a police officers ideal self-image. Whether or not the public likes the cars is incidental since, frankly, the public has little say as to whether or not a new Interceptor, Charger, or Carbon Motors E7 is purchased. What matters is the buy in of police administrators and line officers. All and all, I would suggest that Ford’s first purpose built patrol car is likely to be positive for one important reason: Increased safety. I mean safety for the general public rather than just the officer. Anything that gives officers better handeling and control of the vehicle will save the lives of citizens as it is in the form of traffic accidents that more police and citizens die than any other single cause. Trust me when I say that this is on the mind of every department looking at purchasing new patrol cars.